Here's how to add an existing Google (Gmail) account to your Galaxy Note8. Here's how to manage account sync settings on your Galaxy Note8. Here's how to create a new Google (Gmail) account for your Galaxy Note8. Here's how to activate and setup your Galaxy Note8. Here's how to turn off Android Device Protection for your Note8. Here's how to turn on Android Device Protection on your Galaxy Note8. Learn how to set up your new Samsung Galaxy Note8 with important features and functions. Aprovecha al máximo tu nuevo teléfono con esta lista de sugerencias prácticas. Here's how to change the notification sound for incoming calls and/or messages on your Galaxy Note8. Watch this video to learn how you can use Smart Switch and a Samsung USB connector to transfer apps, contacts and more from an older Android or iOS device to your Samsung Galaxy Note8. Here's how to transfer music files between your Galaxy Note8 and a computer. Learn how to charge your Samsung Galaxy Note8. An interactive map of the Home screen and buttons on your Samsung Galaxy Note8. Discover more about the back of your Samsung Galaxy Note8. Learn how to power on and shut down your Samsung Galaxy Note8. Here's how to manage 'Power mode' settings to conserve battery on your Galaxy Note8. Here's how to turn 'Power mode' for your Galaxy Note8 on or off. Here's how to view the battery status and what apps are using power on your Galaxy Note8. Here's how to make your Galaxy Note8 visible to Bluetooth devices. Here's how to send a contact via Bluetooth on your Galaxy Note8. See how to pair your Samsung Galaxy Note8 with your Bluetooth device. Here's how to turn Bluetooth for your Galaxy Note8 on or off. Here's how to add a speed dial to your Galaxy Note8. Here's how to call a number from your Galaxy Note8. Here's info on what to do if you're calling into an automated system and your dialpad entries aren't recognized. Here's how to place a multi-party conference call from your Galaxy Note8. Here's how to redial the last number you called from your Galaxy Note8. Here's how to remove a speed dial from your Galaxy Note8. 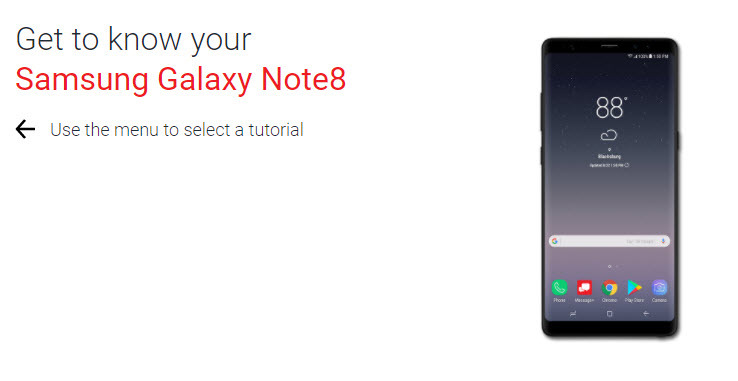 An interactive guide on how to call a contact using your Samsung Galaxy Note8. Discover how to use your Samsung Galaxy Note8 to call a new number. Discover how to make a call in HD Voice on your Samsung Galaxy Note8. Learn how to make a video call on your Samsung Galaxy Note8. A visual guide for ignoring a call and sending a text message to the caller with your Samsung Galaxy Note8. A visual guide on how to return to a call after multitasking, like browsing the internet, on your Samsung Galaxy Note8. Learn how to switch between two phone calls on your Samsung Galaxy Note8. Learn how to teach kids to call 911 on your Samsung Galaxy Note8. Learn how to turn HD voice on and off on your Samsung Galaxy Note8. Discover how to use your voice to place a call with your Samsung Galaxy Note8. Discover how to view a missed call and add it as a new contact on your Samsung Galaxy Note8. Here's how to view or clear the call history on your Galaxy Note8. Here's info on common camera settings for your Galaxy Note8. Here's how to record and share a video on your Galaxy Note8. Here's how to share a picture from the gallery on your Galaxy Note8. Here's how to ahare a video from the gallery on your Galaxy Note8. See how to quickly access the Camera app on your Samsung Galaxy Note8. Learn how to take a picture of the screen and view it on your Samsung Galaxy Note8. An interactive guide on how to change the size of your pictures or videos with your Samsung Galaxy Note8. Aprende a grabar un video usando tu Samsung Galaxy Note8. A visual guide for sharing photos by email, social networks and more using your Samsung Galaxy Note8. Discover how to take a photo using your Samsung Galaxy Note8. Discover how to take a picture while recording a video on your Samsung Galaxy Note8. An interactive guide on how to take a selfie with your Samsung Galaxy Note8. A visual guide for transferring photos to the SD Card in your Samsung Galaxy Note8. A visual guide for how to take a picture with the flash on using your Samsung Galaxy Note8. Learn how to zoom in and out when taking photos on your Samsung Galaxy Note8. Here's how to take and share a picture on your Galaxy Note8. Here's how to view pictures from the Gallery on your Galaxy Note8. Here's how to facilitate a connection between your Galaxy Note8 and a computer with the Android SDK. If you can't transfer media between your Note8 and PC, view this info. Here's how to add a contact to your Galaxy Note8. Here's how to configure how you want your contacts to display on your Galaxy Note8. Here's how to delete a contact from your Galaxy Note8. Here's how to edit a saved contact on your Galaxy Note8. Here's how to export contacts to a SD / Memory Card on your Galaxy Note8. Here's how to import contacts from the SD / Memory Card on to your Galaxy Note8. Learn how to add a new contact to your Samsung Galaxy Note8. Discover how to add or delete contacts from your Favorites list on your Samsung Galaxy Note8. Find out how to add a picture to a contact on your Samsung Galaxy Note8. Learn how to assign a ringtone to a contact, so you know who's messaging your Samsung Galaxy Note8 without looking at it. Discover how to block a number on your Samsung Galaxy Note8. A visual guide for how to create a group of contacts on your Samsung Galaxy Note8. Learn how to share the information for one of your contacts with someone else using your Samsung Galaxy Note8. Here's how to view where a phonebook contact was imported from on your Galaxy Note8. Here's how to restrict the amount of data an app uses on your Galaxy Note8. If your Galaxy Note8 shows the incorrect date and/or time, here's how to correct it. Here's how to view the phone number for your Galaxy Note8. Watch this video to learn how to select either Game Mode, Entertainment Mode or High Performance Mode to optimize your phone for the way you use it most. Here's how to adjust brightness settings for your Galaxy Note8. Here's how to adjust display settings for your Galaxy Note8. Here's how to adjust font settings for your Galaxy Note8. Here's how to manage interruption settings for your Galaxy Note8. Here's how to allow multiple apps on your Galaxy Note8 to run simultaneously on the current screen. Explore how to access settings on your Samsung Galaxy Note8 to change alert sounds, turn off GPS and more. A visual guide for saving battery life on your Samsung Galaxy Note8 by adjusting the screen timeout. Find out how to change roaming settings on your Samsung Galaxy Note8. Learn how to change the ringtone on your Samsung Galaxy Note8. Learn how to manage location settings on your Samsung Galaxy Note8. Discover how to manage data usage on your Samsung Galaxy Note8. Explore ways to mute your Samsung Galaxy Note8. Una guía interactiva para configurar tu Samsung Galaxy Note8 en modo Airplane. Learn how to switch to Battery Saver mode to save your Samsung Galaxy Note8's battery life for the most important functions. Here's how to turn mobile data for your Galaxy Note8 on or off. Here's how to turn download booster for your Galaxy Note8 on or off. Te mostramos cómo conservar la carga restante del dispositivo cuando estás ante una situación de emergencia. Here's how to turn on one-handed operations on your Galaxy Note8. Here's how to fix the color scheme on your Galaxy Note8 if it's reversed. Here's how to fix it the display on your Galaxy Note8 if it doesn't flip or rotate. Here's how to allow your Galaxy Note8 to share the screen / content on a larger display via a wireless connection. Here's how to add an email account to your Galaxy Note8. Here's how to compose and send an email message on your Galaxy Note8. Here's how to delete email messages from your Note8. Here's info on common personal email settings for your Galaxy Note8. Here's how to modify data usage options for the personal email account on your Galaxy Note8. Here's how to configure notifications settings for the personal email account on your Galaxy Note8. Here's how to update the personal email password/server settings for your Galaxy Note8. Here's how to enter or edit the personal email signature on your Galaxy Note8. Here's how to adjust the personal email sync frequency settings on your Galaxy Note8. Here's how to update the work email settings for your Galaxy Note8. Here's how to adjust Gmail sync settings for your Galaxy Note8. Here's how to remove a corporate email account from your Galaxy Note8. Here's how to remove a Gmail account from your Galaxy Note8. Here's how to remove a personal email account from your Galaxy Note8. Here's how to reply to an email message from your Galaxy Note8. Here's how to add a work email account to your Galaxy Note8. Aprende cómo reenviar un correo electrónico en tu Samsung Galaxy Note8. Learn how to attach a file, like a document or photo, to an email with your Samsung Galaxy Note8. Discover how to reply to an email on your Samsung Galaxy Note8. A step-by-step visual guide for sending an email from your Samsung Galaxy Note8. See how to send a group email on your Samsung Galaxy Note8. Learn how to access your work email on your Samsung Galaxy Note8. See how to access your existing email account on your Samsung Galaxy Note8. See how to access different email accounts on your Samsung Galaxy Note8. Here's how to view email messages on your Note8. Here's how to allow motion-activated services on your Galaxy Note8. Here's how to configure Google backup and restore options for your Galaxy Note8. Here's how to turn GPS location for your Galaxy Note8 on or off. Here's how to view notifications on your Galaxy Note8. Here's how to add folders to a Home screen on your Galaxy Note8. Here's how to add Home screen panels on your Galaxy Note8. Here's how to add shortcuts to a Home screen on your Galaxy Note8. Here's how to add a widget to a Home screen on your Galaxy Note8. Here's how to change your default Home screen settings on your Galaxy Note8. Here's how to change your screen on your Galaxy Note8 if it looks different. Here's how to remove a Home screen panels from your Galaxy Note8. Here's how to remove items from the Home screen of your Galaxy Note8. Here's how to rename a Home screen folder on your Note8. Here's how to set a default Home screen on your Galaxy Note8. An interactive guide on how to place apps and widgets on the Home screen of your Samsung Galaxy Note8 for quick access to them. A visual guide for adding emergency information to the lock screen of your Samsung Galaxy Note8. Find out how to add folders to the Home screen on your Samsung Galaxy Note8 to help organize your apps. Learn to add or change shortcuts to unlock the screen on your Samsung Galaxy Note8. See how to add and delete Home screens on your Samsung Galaxy Note8. Learn how to rearrange and resize apps and widgets on the Home screen of your Samsung Galaxy Note8. Learn to change the appearance of an icon on your Samsung Galaxy Note8. See how to remove apps and widgets from the Home screen of your Samsung Galaxy Note8. Learn to use shortcuts to unlock the screen on your Samsung Galaxy Note8. Here's how to view Home screen panels on your Galaxy Note8. Here's how to change the Mobile Hotspot password on your Galaxy Note8. Here's how to change the broadcast settings If you're having issues connecting to your Note8 Mobile Hotspot. Here's how to configure Manage Mobile / Wi-Fi Hotspot Settings (e.g., allowed devices, timeout settings, etc.) for your Galaxy Note8. Here's how to turn Mobile Hotspot on/off for your Galaxy Note8. Here's how to add a VPN connection to your Galaxy Note8. Here's how to change the browser home page from your Galaxy Note8. Here's how to open the web browser on your Galaxy Note8. Learn how to bookmark a website on your Samsung Galaxy Note8, so it's easy to find later. Discover how to find a website using your Samsung Galaxy Note8. Explore how to search the web using your voice with your Samsung Galaxy Note8. A visual walkthrough of opening, closing and switching between windows or tabs in the web browser of your Samsung Galaxy Note8. Here's how to change the language used on your Galaxy Note8. Discover how to change the language settings on your Samsung Galaxy Note8. Here's how to scan additional fingerprints to unlock your Galaxy Note8. Here's how to manage lock screen notifications for your Galaxy Note8. Here's how to configure the screen lock settings for your Galaxy Note8. Here's how to remove fingerprints used to unlock your Galaxy Note8. Here's how to set up face recognition scan to access your Galaxy Note8. Here's how to set up fingerprint scan recognition to unlock your Galaxy Note8. Here's how to set up Iris scan recognition to access your Galaxy Note8. Here's how to set up a screen lock option (e.g., PIN, pattern, password, etc.) for your Galaxy Note8. A visual guide for setting screen security on your Samsung Galaxy Note8 to help protect your private information. See how to unlock the screen on your Samsung Galaxy Note8. Here's how to turn on and customize the Smart Lock setting on your Galaxy Note8. Here's how to disable the screen lock setting on your Galaxy Note8. Here's how to unlock the screen on your Note8. Here's how to check the available storage space on your SD card and/or Galaxy Note8. Here's how format an SD / Memory Card on your Galaxy Note8. Here's how to insert an SD / Memory Card into your Note8. Here's how to remove a SD / Memory Card from your Galaxy Note8. Here's how to connect other types of USB cables or devices to your Galaxy Note8. An interactive guide for setting up your Samsung Galaxy Note8 as a Mobile Hotspot, so you can share your data connection with other devices. Watch this video to learn how to use your Galaxy Note8 customizable Navigation Bar instead of physical navigation buttons. Watch this video to learn how to multitask using the split screen view with Multi Window on your Note8. See how to easily switch between and close apps that are running on your Samsung Galaxy Note8. A visual guide for swiping between multiple Home screens on your Samsung Galaxy Note8. Find out how to access and clear the Notification Panel on your Samsung Galaxy Note8. Here's how to access Tap & Pay service on your Galaxy Note8. Here's how to wirelessly transfer data from your Galaxy Note8 to another NFC-capable device. Here's how to turn Android beam for your Galaxy Note8 on or off. Here's how to turn NFC for your Galaxy Note8 on or off. Watch this video to learn how to use your Apps edge panel to pair your favorite apps and quickly open them in split screen view. Watch this video to learn how to use the Translate feature on your S-pen to read foreign language websites and even hear word pronunciations. Watch this video to learn how to use your S-pen to edit images and save them to your gallery. Watch this video to learn how to use Live Message to send an animated message in your own handwriting. Watch this video for a quick overview on the S-Pen and how to personalize your Air Command menu. Watch this video to learn how to turn a video into a sharable GIF on your Note8 with GIF animation. Watch this video to learn how to use S-Notes to create a handwritten memo and add an image to a sharable note. Watch this video to learn how you can use your S-Pen to take quick notes on any screen of your Note8. Here's how to configure S Pen settings on your Galaxy Note8. Here's how to insert and remove the S Pen from your Galaxy Note8. Here's how to remove the SIM card on your Galaxy Note8. Here's how to change the SIM card lock code on your Galaxy Note8. Here's remove a SIM card from your Galaxy Note8. Find out how to insert and remove a microSD card from your Samsung Galaxy Note8. Find out how to insert and remove a nano SIM card from your Samsung Galaxy Note8. Here's how to turn SIM PIN on or off on your Galaxy Note8. Discover how to access your Facebook account on your Samsung Galaxy Note8. Learn how to log out of Facebook on your Samsung Galaxy Note8 to help protect your account. A visual walkthrough on how to update your Facebook status and post photos using your Samsung Galaxy Note8. Here's how to record and play a sound file on your Galaxy Note8. Here's how to save a ringtone from a message on your Galaxy Note8. Here's how to set a ringtone on your Galaxy Note8. Here's how to utilize the speakerphone functionality on your Galaxy Note8. Here's how to silence or turn off all sounds on your Galaxy Note8. Here's how to place your Galaxy Note8 on vibrate mode. Here's how to check settings if your Galaxy Note8 won't vibrate / make sounds when getting text, email or alerts. Learn how to access settings in Easy mode on your Samsung Galaxy Note8. Discover how to access and clear the Notification Panel while in Easy mode on your Samsung Galaxy Note8. Find out how to set up the Favorite Apps screen while in Easy mode on your Samsung Galaxy Note8. Learn how to set up the Favorite Contacts screen in Easy mode on your Samsung Galaxy Note8. Discover how to make a phone call in Easy mode on your Samsung Galaxy Note8. A visual guide for navigating multiple Home screens in Easy mode on your Samsung Galaxy Note8. Find out how to search from the home screen in Easy mode on your Samsung Galaxy Note8. See how to switch back to Standard mode from Easy mode on your Samsung Galaxy Note8. See how to switch to Easy mode for simplified Home screens on your Samsung Galaxy Note8. Here's how to see why you may not be receiving your multimedia messages on your Galaxy Note8. Here's how to send unwanted calls directly to voicemail for your Galaxy Note8. Here's how to create and send a text message via the Messages app on your Galaxy Note8. Here's how to cut, copy and paste text on your Note8. Here's how to delete messages from the Messages app on your Galaxy Note8. Here's how to manage text (SMS) messaging notification settings on your Galaxy Note8. Here's how to receive delivery confirmation for messages sent fromyour Galaxy Note8. Here's how to change permissions to allow or block sending premium texts from your Galaxy Note8. Here's how to view text messages on your Galaxy Note8. Here's how to set up printing from your Galaxy Note8. Learn to use access Air Command using the S Pen on your Samsung Galaxy Note8. Discover how to add S Health trackers on your Samsung Galaxy Note8. Discover how to add a shortcut to air command on your Samsung Galaxy Note8. Discover how to customize Samsung Health on your Samsung Galaxy Note8. Discover how to find videos and tutorials to learn more about using your Samsung Galaxy Note8. Discover how to measure your blood oxygen level on your Samsung Galaxy Note8. Learn to remove a shortcut from air command on your Samsung Galaxy Note8. Learn to set up your Samsung Health Profile on your Samsung Galaxy Note8. Discover how to use takes notes on your Samsung Galaxy Note8 without having the screen on. Learn to add track your heart heart on your Samsung Galaxy Note8. Learn to use screen write with the S Pen on your Samsung Galaxy Note8. Discover how to use the S Pen's smart select on your Samsung Galaxy Note8. Here's how to change the TTY settings on your Galaxy Note8. Here's how to change the wallpaper on your Galaxy Note8. Learn how to change the background of the Home screen on your Samsung Galaxy Note8. Here's how to turn on Wi-Fi direct so you can easily connect a group on your Galaxy Note8. Here's how to add a Wi-Fi connection to your Galaxy Note8. Here's how to add a Wi-Fi network to your Galaxy Note8 if the one you want doesn't display. Here's how to configure network mode settings for your Galaxy Note8. Here's how to remove a saved Wi-Fi network from your Galaxy Note8. Learn how to use your Samsung Galaxy Note8 to connect to a Wi-Fi network, so you can access the internet without using data. Here's how to utilize your Galaxy Note8 to share Internet connectivity with a computer. When turned on, Wi-Fi Calling may improve indoor call quality for your Galaxy Note8. Here's how to turn Wi-Fi for your Galaxy Note8 on or off.